Now you can relive every action-packed moment of the epic story that Entertainment Weekly proclaims "Riveting"! 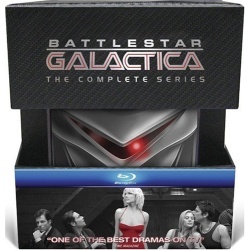 Rejoin the fight to save the human race as a small but determined fleet quests for the fabled planet Earth while being hunted by their nemeses, the robot cylons. Presented uninterrupted and in DTS-HD MA 5.1 Surround Sound, experience the phenomenon from the beginning to end!